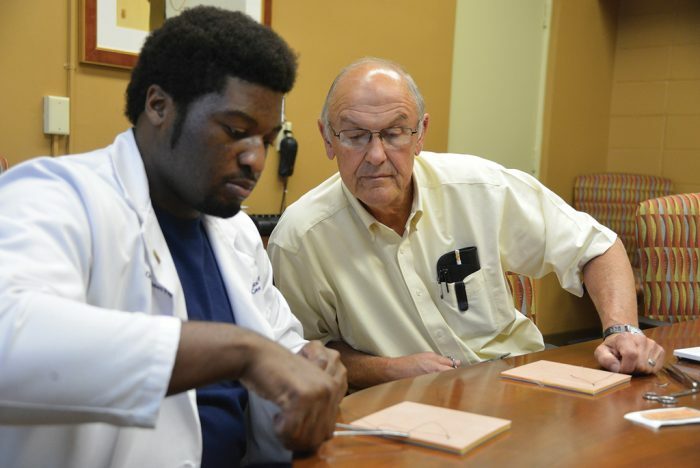 Dr. Bill Pannell (right) works with an MCG student at the Southwest Campus offices in Albany. When Dr. Bill Pannell said he wanted to practice surgery in his tiny hometown, many were skeptical. 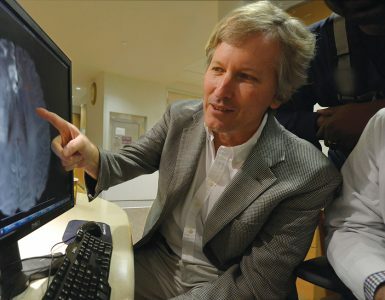 But he’s not only built a strong practice — he’s given back, developing a national program to train surgery residents. Dr. Bill Pannell jokes that he was raised by the entire town of Cordele, the tiny town in southwest Georgia – population 11,000 – otherwise known as the Watermelon Capitol of the World. While it may be a slight exaggeration, he knows his life could have turned out very differently without those who did pitch in. At age 6, Pannell found himself scared and alone, riding a bus the 100 or so miles from his home in Columbus, Georgia, to Cordele. Even at this early age, he had found himself estranged from both parents, and he spent the two-hour ride just hoping and praying that his grandmother Mary Pannell could take him in. Nothing was certain. She had just suffered a heart attack six months before. Pannell’s mother was killed in a car accident two months after he arrived in Cordele. He says his grandmother had already raised seven children as a single, widowed mother through the Great Depression and her already grown children weren’t sure she could handle raising her grandson, too. But she wouldn’t hear it. She knew she wasn’t going to do it alone. That spring had also turned into a tumultuous time for his family – an uncle who had been a father figure to him died suddenly. His estranged father died. Mary had also suffered a heart attack and passed away. He came back to southwest Georgia and enrolled at Valdosta State Univer-sity, using the social security benefits he qualified for after his father’s death to pay for his tuition. 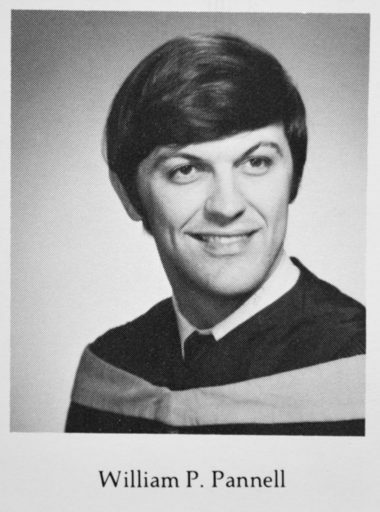 There his adviser, Dr. James Connell, then chair of the biology department, talked him into majoring in science. Pannell moved forward, thinking that he would still be a teacher – just in science, instead of English. Caught up in the social unrest of the ‘60s and in “the fury of young idealism,” Pannell became president of the Student Government Association and fancied becoming a politician. But Connell warned him that route was “just as perilous as being a coach” and suggested he consider medical school instead. He took the MCAT and used his last $25 to pay the application fee for MCG. By that December, he was accepted to the state’s medical school. Pannell arrived at MCG in 1968, and he already knew what kind of doctor he wanted to be. He simply had to think back to his small-town upbringing and the old-fashioned family doctors he’d grown up admiring – the ones who’d done everything from basic care to surgery; the ones who treated the pregnant women, delivered their babies and became their child’s doctor; the ones who treated his beloved grandmother; and the ones who treated him and never sent a bill. Of course there was no question about where he was eventually going to practice. 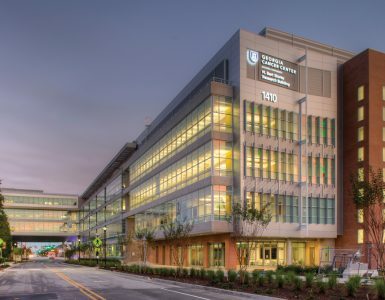 After graduation, Pannell again found himself in a big city that didn’t fit when he traveled to the University of South Florida and Tampa General Hospital for his surgery residency. He says he couldn’t wait to get back home to open up his surgery practice at Crisp Regional Medical Center, his small hometown hospital, which at the time was just a space that served as the operating room and emergency room and a handful of patient rooms. That didn’t matter to him. 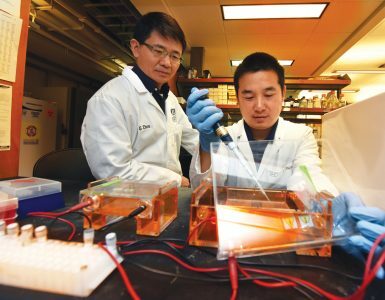 He’d spent nine years in big cities during medical school and residency that just didn’t fit – but his 11,000-population hometown did, to many people’s amazement. In fact, while sitting for his interview with a committee of the American College of Surgeons, a member looked at Pannell and asked a simple question: Why did a board-certified general surgeon want to go back to tiny Cordele? Pannell couldn’t answer him. Turns out, they shouldn’t have been laughing. Shortly after returning home, Pannell began offering surgery rotations to students from his alma mater. He also began working with Dr. Don Nakayama, a Macon surgeon, who had been sending surgical residents to Cordele. They both repeatedly found that residents nearing the end of their five-year training weren’t always ready to operate with minimal supervision, much less alone. The fact that they weren’t board-certified also created liability issues for hospitals if they did. Pannell had a solution. He created the Transition to Practice program, which eases the transition from the end of residency to practicing alone. With Nakayama’s help and insistence, the program was eventually certified by, and today operates under, the American College of Surgeons. There are now 45 programs nationwide, including Crisp’s now three-decades-old program. “When I think about the fellowship we created and what we contribute in our own small way, I think to myself, ‘I wish that old rascal [from ACS] was still alive,’” Pannell says. He also still teaches MCG students – today through the Southwest Campus, where he is clerkship coordinator for surgery, handling the ins and outs of surgery training for students learning in that part of the state and helping recruit faculty to teach them. He’s married to Linda, whom he met during medical school – she was in nursing school. She helped set up Crisp Regional Medical Center’s nursing service and helped develop its Wound Care Clinic. For a decade, while he was the only surgeon at Crisp and would work long hours overnight, she would do his morning rounds for him until he got caught up on sleep. They have three children, all of whom played Division I sports in college. He jokes that they got their athleticism from Linda, who was playing semipro basketball when they met. Their children are William, a high school football coach in Roswell; Stephanie, a colorectal surgeon in Ontario, Canada; and Preston, who works in commercial real estate in Atlanta. Cordele, nestled between Macon and Albany. 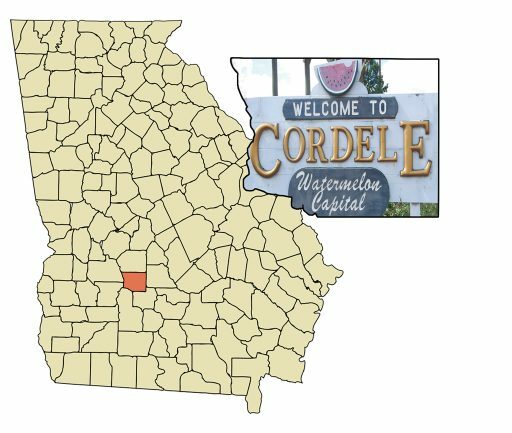 Nestled between Macon and Albany, Cordele, the county seat of Crisp County, faces many of the problems plaguing other smaller, rural communities – a shortage of physicians. A mix of low socioeconomics and lack of access to health care often leads to complicated health issues for the people who live there. Health problems such as malnutrition and obesity, diabetes, cardiovascular disease, substance abuse and poor maternal and fetal health plague the area.